In this talk, Melanie Rieback will introduce the basics of Pentesting ChatOps, and will discuss the processes and open-source tools needed to enable Pentesting ChatOps within your own organization. ChatOps, a concept originating from Github, is chatroom-driven DevOps for distributed teams, using chatbots (like Hubot) to execute custom scripts and plugins. We have applied the concept of ChatOps to the penetration testing workflow, and found that it fits outstandingly – for everything from routine scanning to spearphishing to pentest gamification. This talk discusses the tools that we use (RocketChat, Hubot, Gitlab, pentesting tools), and provides battle stories of using Pentesting ChatOps in practice. Dr. Melanie Rieback is the CEO/Co-founder of Radically Open Security, the world’s first non-profit computer security consultancy company. 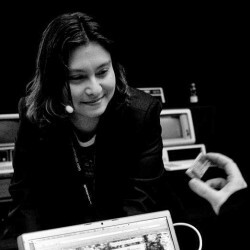 She is also a former Assistant Professor of Computer Science at VU who performed RFID security research (RFID Virus and RFID Guardian), that attracted worldwide press coverage, and won several awards. Melanie was named one of the fifty most inspiring women in tech (Inspiring Fifty Netherlands) in 2016 and 2017, and the Most Innovative IT Leader by CIO Magazine NL (TIM Award) in 2017. Her company, Radically Open Security was also named the 50th Most Innovative SME by the Dutch Chamber of Commerce (MKB Innovatie Top 100) in 2016.